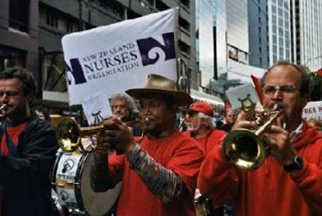 This year, Wellington group Brass Razoo Solidarity Band clocked up its tenth year of street performances in support of workers’ strikes and anti-war marches. The Spark talked to BRSB founder Don Franks. Spark: How did the band start off? Don: For a long time I’ve contributed little bits of music to support workers’ battles, like making up songs and singing them on picket lines with my banjo. One day I bought this ancient tenor horn for twenty bucks. My idea was to stick it on the wall as an ornament but when I tried blowing I found it still worked. Next day I took it to blarp at an anti-sow crate demo, where they wanted lots of noise. Walking home afterwards, I envisaged lots of horns being played properly at a demo. I recalled that postie John Maynard had played cornet when he was a kid, so I rang him up and said “John, how about we make a union band?” He was keen, and it took off from there. Five of us got together and began rehearsing a rough garage group with a cornet, tenor horn, tuba, snare drum, and a bass drum made out of a rubbish bin. Spark: What was your first gig? Don: A month or so after our formation we got the word that wharfies were picketing Carter Holt Harvey out in Tawa. We headed out with our drums and brass and made a racket alongside them. The workers liked it. As we were packing up a lady from a plumbing warehouse across the road came over and said they wanted an Oompah band for the lads’ Christmas do and would we play the gig? Our total repertoire then was just three numbers, plus we don’t play for hire, so we passed the job to another band. Spark: Where did the band go from there? Don: We rehearsed every week, improved a bit and got more members. Two of those were musical radio journalists who joined us to support their own strike and stayed on. There’s thirteen of us now and always room for more. Spark: How many gigs have you done over the years? Don: No-one’s kept count, but it would be more than a hundred, maybe two. We’ve played for just about every union except the Police Association. Mostly for low-paid workers like cleaners and caregivers; also teachers and students. Spark: Ten years is a long time — what’s kept the band together? Don: We’ve seen that what we do is worthwhile. Our playing breaks the ice at the start of a picket, especially if that picket’s rather small. We help build a happy militant mood. Our group’s independence helps keep our unity too. Right at the start we made a policy that we wouldn’t play for any political parties. That was intended to stop us being hijacked by Labour — or some small left sect. Spark: What was your best gig? Don: Hard to say, after a while they sort of blend into one. A memorable blow was busking to raise funds for the locked-out Progressive workers. We got hundreds of dollars in a very short time. The Civil Union victory parade was special for me. I also enjoyed playing the Internationale for striking hospital workers and telling them the significance of that number. Spark: What’s the future for Brass Razoo? Don: We’re all still keen. I personally hope we keep playing long enough to blow a fanfare at the downfall of capitalism!